Bhopal, January 30, 2016 (Muslim Saleem): Chief Minister Mr. Shivraj Singh Chouhan has said that folk culture is inseparable part of our life. State’s various regions have rich traditions of fold culture. He said that initiative will be taken to include folk culture in syllabus of schools and colleges. Mr. Chouhan was addressing Siddhi Bagheli Baja programme during ‘Siddhidatri Lok Rang Mahotsav’ focusing on tribal and folk arts at Sidhi today. The Chief Minister lauded folk dances and songs presented by artistes of Sidhi district. Specially lauding Bagheli, Karma, Shaila, Gudumbaja and Ahirai Lathi presentations, the Chief Minister announced prizes of Rs. 1.25 lakh each for artiste’s troupes. The Chief Minister was so overwhelmed by folk dances and songs that he could not withhold him from shaking a leg with artistes. He played on cymbols and Nagadiya with artistes. He also felicitated artistes. The Chief Minister said that Lok Rang stage will be constructed in 115 folk art dominated villages of the district and refinement workshops will be held. He said that a programme of Sidhi district’s folk artistes will be held at Bhopal soon. The Chief Minister said that the state government will organize 3-day Sidhi Mahotsav-Lok Rang every year. The Chief Minister said that Sidhi district and city will be developed ideally with good roads, drinking water supply, expansion of irrigation facilities and electrification works on priority. The Chief Minister dedicated 13 construction works costing over Rs. 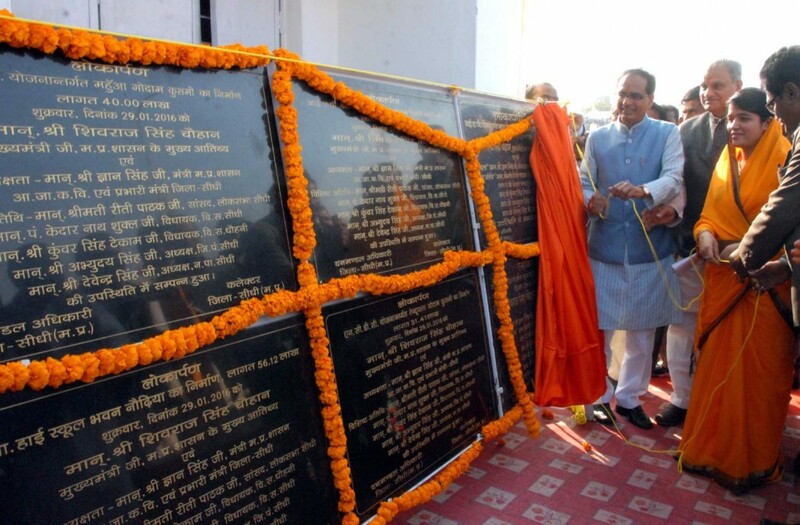 11 crore and laid foundation stones of 8 construction works costing over Rs. 18 crore.